Although his service record is still held by the Ministry of Defence, I have pieced together his life and military service as best as I can. The bio below, especially the story of the action he won his V.C. in is based on a mixture of many sources and is as accurate as I can portray. Tom Edwin Adlam was born at Waterloo Gardens in Salisbury, on the 21st October 1893, the son of John and Evangeline Adlam. Following his education at Bishop Wordsworth's School, Salisbury, he was training to be a teacher and joined the Territorial Force in September 1912. When war broke out in August 1914, Tom Adlam was embodied for service and had worked his way up to Sergeant when commissioned as a Second Lieutenant in the Bedfordshire Regiment in November 1915. He joined the regiment at Sittingbourne, Kent, and was soon moved to and trained as Bombing Officer as he had the unusual tlent of being able to throw Mills bombs '40 yards' with both arms, which he put down to years spent playing cricket. The 7th battalion served with distinction on the Western Front and had suffered heavy losses since the opening day of the battle of the Somme on the 1st July 1916. They had been in the front assaulting waves on that notorious day, which saw them storm and hold the German positions on the southern edges of the battlefield. Not only had they been one of the few British battalions to successfully get into the German trenches, but they had taken the front three lines of enemy trenches as well as the heavily fortified and stubborn Pommiers Redoubt that bristled with machine guns. 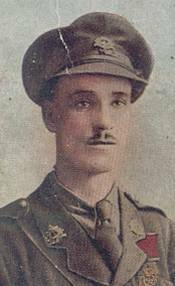 Two weeks later they were again mauled during the assault on the deadly Trones Wood, after which battle a further draft of reinforcements saw the new Second Lieutenant Tom Adlam join them in the field on the 18th July 1916. He was posted to C Company and, other than two weeks in August spent in the front lines opposite Lille, spent the period leading up to the storming of Thiepval and the Schwaben Redoubt in reserve positions. Here the battalion initially rested after their ordeal on the Somme, then started training for their involvement in the Somme battles that September. Tom joined what he called a 'very happy platoon' and remarked how he was never bitten by a bug during his time on the Western Front, although his impression of it all was that it could be 'bloody awful at times'. His mother died while he was on the front that summer but as the burial and service would have been finished by the time he returned to England, he chose to remain with his platoon. This innocuous decision would ensure he was with the battalion while they stormed Thiepval and the Schwaben Redoubt, otherwise he would not have been with them during the action that saw him win the Victoria Cross. 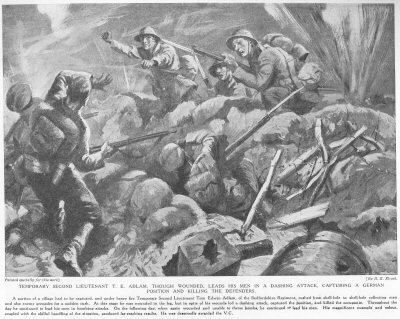 In what would go down in the Regimental annuls as one of the finest military feats of the battalion's impressive involvements in the war, the 54th Brigade were 'wound up' to take on the defensive positions around Thiepval with the 7th battalion assigned to assault the 'impregnable' and formidable defensive work called the Schwaben Redoubt once the village itself had fallen. Thiepval stood on a high ridge that dominated the surrounding countryside. The fortified village itself sat in the middle and on either shoulder of the ridge the defenders had built redoubts to repel any attempts to overrun the ridge. These redoubts were complex tangles of barbed wire, trenches, reinforced machine gun posts and dugouts in which the defenders could shelter from shelling. The Ulstermen of the 36th Division, despite the bravest of attempts, had failed to hold it on the 1st July when they were assigned the unenviable task of assaulting it and had almost been wiped out in the process. Early in September the relatively inexperienced Territorial troops of the 49th (West Yorkshire) Division had also failed to take it but the shoulders of the ridge had finally been captured. After almost three months of horrific battles and casualty levels, the now highly experienced 54th Brigade were moved up overnight to make yet another attempt at taking the carefully crafted positions high on the Thiepval Ridge. The assault on Thiepval - 26th and 27th September 1916. On the morning of the 26th Tom Adlam and the battalion were moved through a heavy German barrage that ringed Thiepval and held in reserve as the other three battalions of the 54th Brigade assaulted the fortified village. At 12.30pm, after a creeping barrage that got the troops to within striking distance of the German front lines, the Brigade launched themselves at the village. Their first objective fell, being to reach the road running east-west through the village, but no further progress could be made so the survivors dug in and protected their gains. At 1am on the 27th the Bedfords were issued orders to prepare to assault the untaken northern portion of the village and at 2am the battalion officers held a conference in the Chateau to discuss their plans. The route to the front line was extremely unclear, the ground was unknown and the battalion were given no time to prepare for the assault. Nevertheless they set about their task and at 5.30am on an extremely dark morning that caused the assaulting companies a lot of trouble when forming up, the battalion shook themselves into two assaulting lines facing the northern section of the village. With D Company still forming up on the left in the growing light, Tom Adlam and C Company on the right charged across the open road, swept into the village despite heavy machine gun and rifle fire. D Company, who could not get into position until 6.50am soon followed on in support and by 8am they took the remaining part of the village. In a bloody, confused fight in the dark over 100 Germans were killed by rifle fire and bayonets and 36 were taken prisoner, almost all of which were wounded so could not fight on. Each house was heavily fortified and resembled a mini fortress in itself so had to be taken by the point of the bayonet and hidden machine gun nests were charged and overcame one by one. Vicious bombing duels prised stubborn German defenders from their hiding places and few of them surrendered even when their positions were hopeless. Despite the apparent odds being in the Germans favour, the Bedfords' training, elan and sheer bloody mindedness won the day. A and B Companies quickly moved up and helped fortify the newly won line in readiness for German counter attacks as the 3 other mauled battalions were withdrawn to supporting areas, out of range of the German artillery that soaked the area. 2 Officers and 110 men from the battalion became casualties in the assault, which, considering the positions they took, was a remarkably light toll. After almost three months of a determined and skilled defence, the German strongpoint of Theipval had fallen and the Bedfords were not about to let it be retaken. The fall of the village allowed for the assault of the second line of German defences high on the crest of the ridge, which included the formidable Schwaben Redoubt. The battalion's C.O., when writing his report of the day's operations was full of praise for his men who had once again triumphed despite the most difficult of conditions. He wrote "... is rare proof that the discipline, determination and morale of the men was of a very high order. In my opinion the ensuing operations, successful though they were, in no way compares with those of the 26/27th"
The assault against the Schwaben Redoubt - 28th and 29th September 1916. Overnight Second Lieutenant Adlam and the now exhausted men worked like fury to prepare for their assault on the 'impregnable' positions on the 28th, fully aware what the redoubt had done to all battalions and their attempts to assault it before. By noon on the 28th the battalion were ready, with A and B Companies in the assaulting waves and D Company assigned to clear the dugouts. C Company, including Tom Adlam, was held in close support ready to be pushed in should the going get too tough for the assaulting waves. Adlam recalled how the men stood around chatting, smoking and telling dirty jokes as they waited, even remembering how a 'particulary unpleasent smell' left over from previous fighting was written off as someone having an accident in their trousers, to the great amusement of the waiting soldiers! With the Queen's battalion from the 53rd Brigade to their immediate right and supporting fire provided from the British trenches on their exposed left flank the battalion formed up for the assault and at 1pm the barrage soaked German positions. The relatively new concept of the 'Creeping Barrage' was employed, meaning that the line being bombarded would be moved back 100 yards at pre arranged intervals. Whilst the barrage was pounding German positions, very little fire was experienced by the battalion as they formed and advanced to within 50 yards of the inferno being unleashed on German trenches but as soon as it lifted every machine gun left intact opened up on them. A Company on the right made for the cemetery but their right hand platoon were wiped out to the man by German machine gunners who mowed them down from the redoubt at the top of the ridge. The Queen's battalion also veered into the Bedfords line of advance, forcing A Company further to the left and away from the cemetery where they met stiff machine gun fire from German positions on their left flank. Those who could not reach the relative safety of the German trench running back towards the second line went to ground and, when Tom Adlam and the supporting waves came along, were swept with them towards the redoubt. Back at Battalion HQ in the village the adjutant, Captain Bridcutt, noticed a large group of Germans lining the parados of a trench running to their rear through his recently discovered German periscope and ordered a collection of cooks, signallers, runners and servants to fire on them. The Germans were quickly scattered and sent running back in the direction of St. Pierre Divion, thus allowing the right side to get their assault going again. B Company on the left made quicker progress and reached the German trenches almost immediately. Much of their section of trench fell within the first 15 minutes as they quickly killed, captured and routed the defenders before they could establish a defensive position. Adlam himself remarked that they advanced right on the heels of the barrage and when they were at around 50 yards from a huge crater just in front of the main redoubt, they found it was lined with Germans who opened up on them with all they had. The company went to ground and Adlam sought the Company O.C. in another shell hole, nicknamed Father, to debate what the best course of action was. He decided to 'have a go at getting in' to the German trenches, to which Father solemnly shook his hand before departing, expecting to not see him again. Having played a lot of cricket, Tom had a stronger than normal arm and was capable of throwing grenades further than most. The men fed him with bombs and he threw them from his shell hole until it was feasible to rush the surviving defenders. Moving in short burts, his platoon made it into the German trench and, charging along the trench 'like a lot of mad things', they bombed the more stubborn German posts including a well defended machine gun position. On arriving at a second machine gun post which was causing havoc among the attacking troops, Adlam had already run out of bombs but his platoon collected every German stick grenade they could lay their hands on. Stacking them up next to him, Adlam threw one after another in a continuous stream, silencing the post and allowing his platoon to clear it with their bayonets, before moving on to clear the entire section of trench in the process. Lieutenant Adlam was wounded in his throwing arm during the phase that saw them pushing through the heavily defended trench but he simply reverted to using his other arm which was just as effective! He led his men from the front and continually bombed their way deeper into the German first line positions, remarking how even the gentlest and calmest men in his platoon lost both personal control and all shreds of mercy whilst in the heat of a battle like the one they were embroiled in. Once cleared, they started moving along the trenches towards the next line of trenches but many of the sections had been blown in by the artillery barrage, making their journey even more hazardous. By 3pm both parties were in the second line of German trenches as well as the redoubt itself and started bombing their way along the heavily protected trenches yard by yard. Section after section fell and defensive posts were established to repel any German counter attacks aimed at them. At about 4pm the shortage of Mills Bombs was getting acute so parties quickly salvaged German grenades for use in their defensive battles to come. The situation was precarious as the Queen's to their right had not reached their objectives, leaving the Bedfords isolated and vulnerable. A long section of trench to the right of the battalion was not known to be in British hands so, with no bombs available, the Bedfords started to clear that section using just determination and their bayonets. When the C.O. arrived in Adlam's section he insisted Tom retired due to his wounds, so he retired, escorting a dozen POW's to the rear when he went back. By 7.15pm the redoubt was more secure but neither bombs nor water had arrived and the casualties were mounting. Captain Keep on the extreme left cleared a disputed section of trench and managed to link up with the West Yorkshire's, thus consolidating that flank somewhat. When supplies of bombs arrived at 9pm the battalion knew they had a chance of holding the position despite there still being no water. All that night bombing duels raged all along the redoubt as parties of Germans tried desperately to regain the position before British reinforcements could scramble through the barrage now swamping the areas around the ridge. Around midnight a Company from the West Yorkshires reinforced the battered battalion and officer patrols were started to keep the exhausted survivors awake. One point at the northernmost end of their position was lost early in the morning to a massive bombing attack under cover of smoke but by daylight on the 29th, the redoubt had been held. At 6am relief came and section by section, the utterly exhausted and desperately thirsty men were sent back to assembly points in reserve at Thiepval. After all their efforts and sacrifice, a significant foothold had been established in the formidable Schwaben Redoubt. It would be weeks later that the Cambridgeshires, Black Watch, Hertfordshires and other British battalions would take the trenches on the reverse of the hill, but, for now, the front of the redoubt was in British hands. As in numerous other battles, single trench lines were now shared between British and German forces with bomb stops and barricades put in place to keep one another in check. But for now the expensive gains atop Thiepval Ridge were consolidated and held. In his battle report the battalion C.O. could not praise his men enough. One of the comments reads; "As inevitable, the question of water was one of extreme difficulty, by far the larger majority of the men fought on without fluid of any sort from Zero. The courage, resolution & endurance displayed by all ranks was quite wonderful. They were out to kill and the Battlefield is a witness that they carried out to the full their intentions. Even when the Battalion had been relieved by the R.W.K. and volunteers were called for in the event of a counter attack being successful on the ground they had so dearly won the preceding day, every man declared his willingness to return at once if needed." As with the assault on the Pommiers Redoubt on the 1st July, the battalion had once again performed an incredible feat in taking the Schwaben Redoubt. Personal congratulatory messages poured in from everyone from Sir Douglas Haig downwards. Dozens of gallantry awards were handed out in the coming weeks and months which included a well earned Victoria Cross for 2nd Lieutenant Tom Adlam, as well as many D.S.O. 's, D.C.M. 's and dozens of Military Crosses and Military Medals. Unfortunately over 100 Officers and men lost their lives during the assaults on Thiepval and the Schwaben Redoubt with around 300 more being wounded. The Brigade's commanding Officer visited the remnants of the battalion on the 1st October and said "The 7th Bn. Bedfordshires were one of the best fighting battalions it was possible to find & he was very proud to have such a battalion under his command" The War Diary added that "he particularly referred to the severe fighting & the daring manner they had snatched from the Bosch a position they boasted of being "impregnable & impossible for the English to take". "Second Lieutenant 7th Bn, Bedfordshire Regiment. For most conspicuous bravery. A portion of a village which had defied capture had to be taken at all costs, to permit subsequent operations to develop. This minor operation came under very heavy machine-gun and rifle fire. 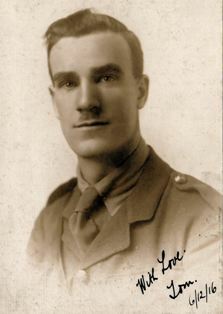 Second Lieutenant Adlam, realising that time was all-important, rushed from shell-hole to shell-hole under heavy fire, collecting men for a sudden rush, and for this purpose also collected many enemy grenades. At this stage he was wounded in the leg, but nevertheless he was able to out-throw the enemy, and then seizing his opportunity, and in spite of his wound, he led a rush, captured the position and killed the occupants." 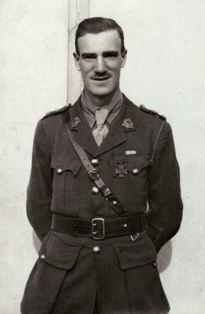 Lieutenant Adlam was in Colchester recovering when news of his VC reached him. No one had mentioned him even being proposed for a medal but he returned to the Orderley Room from a night out only to find himself swamped with telegrams. Calling his father to ask what everyone was congratulating him for and why newspaper people wanted to get his photograph, his father was the one to give him the news! Although I am unable to confirm this due to the lack of a service record, Tom Adlam does not appear to have served on the front lines after this battle, at least not within the Bedfordshire Regiment. He was transferred into the newly formed Royal Air Force and ready for embarkation to Singapore when news of the Armistice came. Being stationed in Cambridge, he joined the celebrations and, getting carried away, climbed the flagpole in the main market square. In his interview he revealed he was more terrified then than at any stage of his assault against the Redoubt but could not climb down and lose face! After the war he served in Ireland and continued to have connections with Sandy in Bedfordshire, where he was the first chairman of the local British Legion branch between 1922 and 1926. After retiring from the Reserve of officers in February 1923, Tom was the Assistant Master at Sandy Church of England School. While in the area, he was the Scoutmaster and a member of the Biggleswade Footbal Club. In 1926 he moved back to Wiltshire and became headmaster of the village school in Blackmoor, Hampshire, where he lived with his wife Ivy and their four children. World War 2 saw him recalled, serving in the Royal Engineers movement control section as Embarkation Commandant at Tilbury, and later in Glasgow, after which he returned to family life. After a full and relatively long life Tom Adlam died on the 28th May 1975, during a family holiday on Hayling Island, Hampshire. He was 81 years old and is buried in St Matthew's Churchyard, Blackmoor, near Liss in Hampshire. The Regiment displayed his medals until recently, but since the 27th September 2003 his medals and a gold watch presented to him on his return from France have been on display in Salisbury's Silver Cabinet in the Grand Jury Room at the Guildhall. The Imperial War Museum Sound Archive interview, reference 35.